Did Japan Display just confirm a waterproof Apple iPhone 7? Japan Display is one of the display manufacturers that supplies the major smartphone producers like Apple. The company has just introduced its next-generation Pixel Eyes LCD screen. The next version of Pixel Eyes will feature a thinner bezel measuring .5mm, down from the .8mm bezel found on the first-gen screen. In addition, the display on the new version can now recognize stylus inputs as thin as 1mm in size. The previous generation Pixel Eyes could recognize inputs no thinner than 2mm. 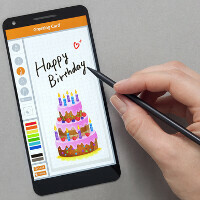 With the improved senitivity, the artist can draw with more detail on the display. Another feature new to Pixel Eyes allows the screen to work even when the user has wet hands and fingers. While there has been talk about an AMOLED screen for the iPhone, it is not going to happen this year. And that means that Japan Display could end up shipping the second-generation Pixel Eyes screen to Apple for the Apple Phone 7. And interestingly, this news just might confirm that the iPhone 7 will be waterproof. It is one thing to produce a handset that can survive spills, rain and even getting submerged in water. But waterproofing a phone isn't 100% useful unless the screen can still track the inputs made by a wet finger. may be next iphone . . . so apple can milk their customers more. Hahaha! Post of the day. Hahaha. They've delve into silence. Your icon looks familiar, what's that from? If you're into anime. This is one of the pioneer. Samurai X. Watch the OVA though. Sounds familiar, I think I watched a few episodes before. Would have to hunt it down to watch it though and I'm kind of a lazy SOB, but that's for the information! Amoled is exclusive to Samsung. Can't wait for Apple to get mitigated. Why do iFans, iUsers care about specs? To them they love flocking the iLogo, which some idiots made them a hype. How long did that take you to write? He just copied and pasted from gsmarena. Does iphone even have Glove mode? Nope, I just checked, It's very hard to touch things though my thin shirt on my 6s plus, pressing harder helps but it doesn't work everytime. So, Apple pencil support? Anyway, what about power efficiency? How does this point towards the next iphone being waterproof though? Som1 plz explain. Let's start from the beginning. Japan Display supplies Apple. It's next-gen screen supports wet fingers. Apple's next iPhone is rumored to be waterproof., It all makes sense. As far as click bait is concerned, that's not us. Perhaps you have us confused with another blog you read. Regards, Alan F.
Because of the wet finger track. That means it could be used for the Z6 as well (JDI is partially owned by Sony) but PA wants to write as many articles about the iPhone I guess. They sure love to write anything for fruity.